The PE-backed companies have outperformed their industry peers in terms of growth in sales, profitability, wages and R&D investments. 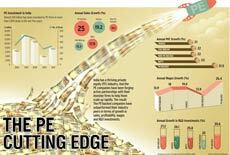 India has a thriving private equity (PE) industry. And the PE companies have been forging active partnerships with their investee firms to help them scale up rapidly. The result: The PE-backed companies have outperformed their industry peers in terms of growth in sales, profitability, wages and R&D investments.